Senior Advocate of the Supreme Court P P (Parameshwar) Rao, defended the living document of our nation, i.e., the Constitution of India. With his argumentative skills and interpretative creativity, Indians won two very important cases. One – securing the secular character of the nation, Two- giving all important right of voters to information about criminal, educational and economic background of contesting candidates, which could be otherwise their private information. He defended dismissal of BJP Governments in Uttar Pradesh, Rajasthan, Madhya Pradesh and Himachal Pradesh by the PV Narasimha Rao’s cabinet, after Kar Sevaks were sent to Ayodhya that ultimately led to demolition of the structure on Rama Janma Bhumi. Prime Minister PV, perhaps could have found solution to the critical issue of Ayodhya with the able support of officers like OSD Mr PVRK Prasad and Rao, the then Union Law Secretary now a Judge of International Court on Seas. The destruction of Ayodhya’s controversial structure unleashed large scale communal violence, the most extensive since the Partition of India. There were massive rioting across the country, and almost every major city struggled to control the unrest. If the policy and program of four states and a party that was ruling them was focusing on the controversial structure at cost of peace and social fabric that has to invoke the internal emergency in those states as constitutional machinery broke down. Liberhan Commission, after extensive hearing and investigation, exonerated PV Narasimha Rao. The Commission was convinced he could not impose President's Rule "on the basis of rumours or media reports". The state "deliberately and consciously understated" the risk to the disputed structure and general law and order. It also said that the Governor's assessment of the situation was either badly flawed or overly optimistic and was thus a major impediment for the central government. The question before the Supreme Court was; how could the ineptitude, unconstitutional action and inability to control the crowd leading to demolition of the mosque be a ground for dismissal of governments in BJP ruled states using Article 356. PP Rao had propounded the 'common thread' theory and said states ruled by the same political party had felt the same seismic vibration of unconstitutional action by state governments during the demolition of the mosque. Emphasising the Constitution's secular nature, he had argued that non-secular policies, programmes and acts of political parties placed such parties outside the pale of the Constitution and hence the Centre was justified in dismissing them. Rao convinced the Court that all the four BJP Governments had acted in concert and violated the basic feature of secularism by mobilizing, encouraging and supporting the Kar Sevaks who demolished the structure. The Supreme Court upheld all the four Proclamations without any dissent accepting the PPRao’s proposition. (SR Bommai v Union of India, AIR 1994 SC 1918). Not only these two cases, PP Rao is associated with almost all land-mark decisions of apex court on Constitutional governance, be it Parliamentary privileges, (PV Narasimha Rao case 1998), fighting evil of capitation fees (Unnikrishnan’s case, 1993), prevention of exploitation by private academic institutions (TMA Pai 2002) etc. His research was one of the inputs in (Keshavanda Bharathi case, 1973). Son of a farmer, PPRao’s journey was full of ups, downs and turns. From a village Mogilicherla in Prakasham moved to Kanigiri, a nearby town for high school studies. He saw his brother Sudhakara Rao and his father’s brother Pavani Ramakrishnaiah practicing in local courts. 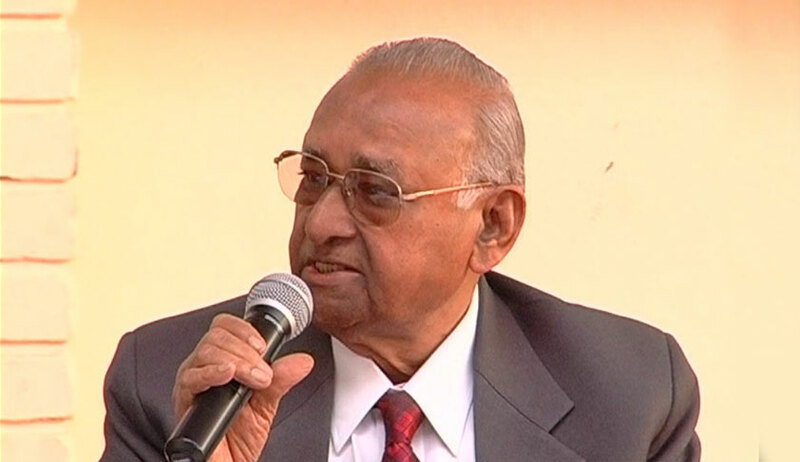 Their helping attitude and integrity followed by high reputation inspired PP Rao to become what he was. After his BA, the family ran into financial problems and he could not get funding for further education. He went in search of job to Chittor, to be a small teacher. As he entered the school building he was impressed by the motto written above “Look up, Aim High”; he did. His elder brother Sarveshwar Rao, associate of the statesman from Andhra Pradesh, VB Raju and PV Narasimha Rao, encouraged him to pursue the study of law. Rao obtained LLB in 1957. Intending to be a law teacher he joined LLM. He wanted to make good lawyers. In the initial attempts failed as two vacancies were filled with his principal’s son-in-aw and another on recommendation! Later dream came true in 1961 as Dr Nagendra Singh selected him. Dr Singh was the subject expert who later became judge of International Court of Justice, who assigned PP Rao to be research associate to Prof LR Siva Subramanian, a visionary who designed law faculty into a most prestigious one in DU. While teaching law, he joined as Constitutional law researcher the chambers of prominent Senior Advocate of Supreme Court Mr N C Chatterjee, a former Judge of Calcutta High Court and sitting Member of Parliament (father of Somnath Chatterjee, who held office of Loksabha Speaker). In an interview to a law web-journal, he said “The most exciting and momentous case in which I had the privilege of assisting him was the Presidential Reference in the UP Assembly Privileges case in 1964. One Keshav Singh was ordered to be taken into custody for breach of privilege of the UP State Legislative Assembly. He challenged the order through his lawyer Solomon and sought a writ of habeas corpus. A Division Bench of the High Court issued notice and granted exparte bail as the Government Counsel did not appear. Reacting sharply, the Assembly resolved to issue warrants of arrest to the Petitioner, his Counsel and the two Hon'ble Judges of the Allahabad High Court for contempt of the House. There was a direct confrontation between the Legislative and the Judicial wings of the State. Prime Minister Jawahar Lal Nehru wisely intervened in time to defuse the crisis by causing a Reference to be made to the Supreme Court under Article 143 of the Constitution of India of the questions of law involved with respect to the existence and extent of legislative privileges and the scope of Judicial Review thereof. Mr. NC Chatterjee was engaged by Mr. Justice GD Sehgal one of the two Hon’ble Judges who entertained the Writ Petition. The opinion of the Constitution Bench gave a quietus to the issue by classic exposition of Constitutional Law in this sensitive area”. One day Mr. Chatterjee asked him to join as Advocate in his office. Even as he decided to resign faculty job, his wife and son were worried about leaving definite income from teaching to chase uncertainty in advocacy. Highly confident Rao assured her and took the challenge, which fetched him Rs 800 in the first month. He did not look back. PP Rao became Senior Advocate within 9 years. He wrote a book on Emergency and Law jointly with Chatterjee that was published by Asia Publishing House of New York. For his talented advocacy he should have been the Attorney General of India. Congress Government disappointed him but gave Padma Bhushan. His child-hood friend N V Ramanayya published a big volume of book edited by this writer. During the release of this book, his colleagues and classmates in both Nellore and Prakasham districts received PP Rao with all affection. After Tanguturu Prakasham, a legendary advocate and statesman, whose name was chosen to the district, PPRao is the jewel from that region. He is unforgettable. His residence in NOIDA flooded with visitors after the news of his demise on 13th September, while thousands paid homage at the funeral in Lodhi Raod on 14th and joined in prayers at the colony on 16th. His grieving younger brother says: “Our elder brother Sarveshwar Rao generally does not praise anyone. He used to say “Parameshwar is very good person among all of us”. An advocate says: “Rao has no enemies- Ajata Shatru”.